Every year when the 'Big Youtubers' release their Christmas Gift Ranges, I'm always intrigued by them but i personally don't like to pay full price. 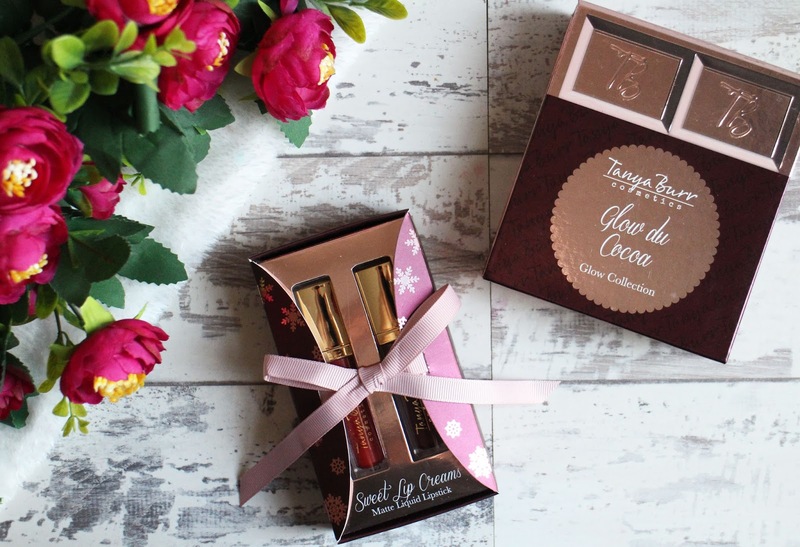 Instead, i wait until the Boxing Day Sales as Superdrug tends to do some pretty good reductions on their sets - this year, i managed to get my hands on quite a few sets including the Tanya Burr Glow Do Cocoa and the Tanya Burr Sweet Lip Creams Matte Liquid Lipsticks. **Disclaimer - please bear in mind that these are Christmas Sets bought in the Boxing Day Sales and the prices may have changed or they may no longer be available if you decide to go and get them. I've not actually tried any Tanya Burr Cosmetics since the very first release of her Lip Glosses and Nail Polish many years ago and whilst i liked the lip glosses, the formula was very questionable but from many reviews that I've read over the years her make up range seems to have improved a lot so I'm very intrigued to see the difference between then and now. 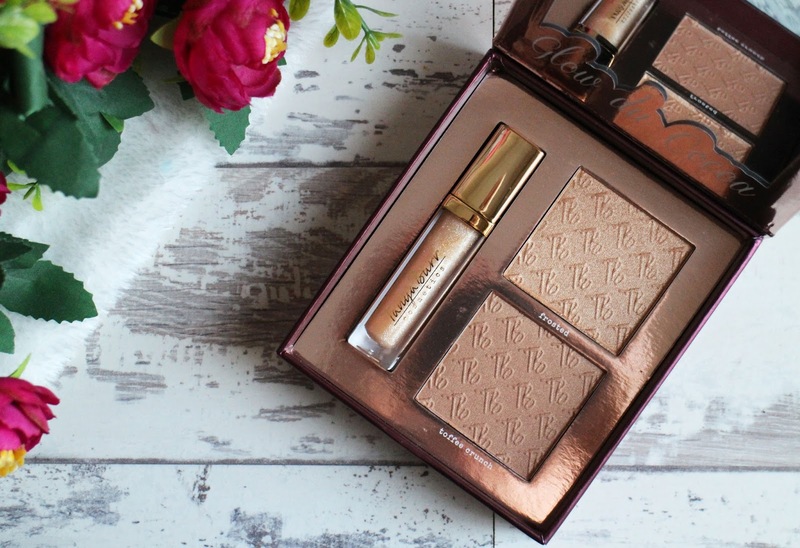 This bronzer and highlighter glow set is very aesthetically pleasing - there is no denying it's a beautiful gift set, I'm rather enjoying wearing bronzers (and highlighters obviously) so i was very interested to see what I'd think. I'll hold my hands up and say i really wanted to write this post and say how much i hated this product because I'm just so cynical when it comes to youtubers ranges but i can't. The Bronzer (Toffee Crunch) is beautiful; i don't quite know how to describe the shade, i feel like the name toffee covers it quite well, it's a toffee brown with a slight orange tone to it. It is a shimmery bronzer which i don't normally go for, i would prefer this to be matte. That being said, it actually looks beautiful on and it gives you that perfect sunkissed glow. As I'm pale, i do have to be a little careful with application - it is quite pigmented so a little bit goes a long way, otherwise it can look quite heavy and muddy at least it does on my skin but a light hand and a bit of blending (i like to go back in with my powder brush to really work into it) it looks really nice. The highlighter (frosted) is also really pretty - it's has a orange/golden tone to it and gives such a beautiful glow to the skin. 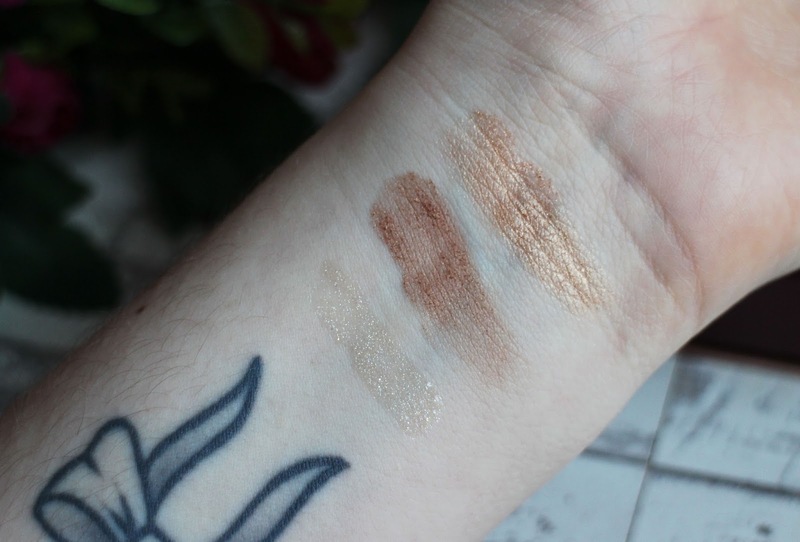 The tone of this highlighter is a little to dark for my skintone, which is a bit annoying because it is really pretty - i can just about get away with it, if I'm careful about the application but too much just looks a bit odd and i am someone who likes to apply a lot of highlighter so i feel like if this was less orange toned it would be a really beautiful highlighter. The quality of these products are really good; they're pigmented, buttery and apply beautifully. If you are someone has a deeper skintone or even someone who likes fake tan this set would look beautiful on you. The sunkissed glow it gives the skin is honestly so beautiful and against a deeper skintone it would be stunning. This kit also comes with a lip gloss (Caramel Glaze) - It looks like a really beautiful sheer glow with glittery shimmer running through it but i honestly can't comment on what this is like because I've passed it onto my sister. She really liked the look of it and it's not something i think I'd get a lot of wear out of so I've given it to her. 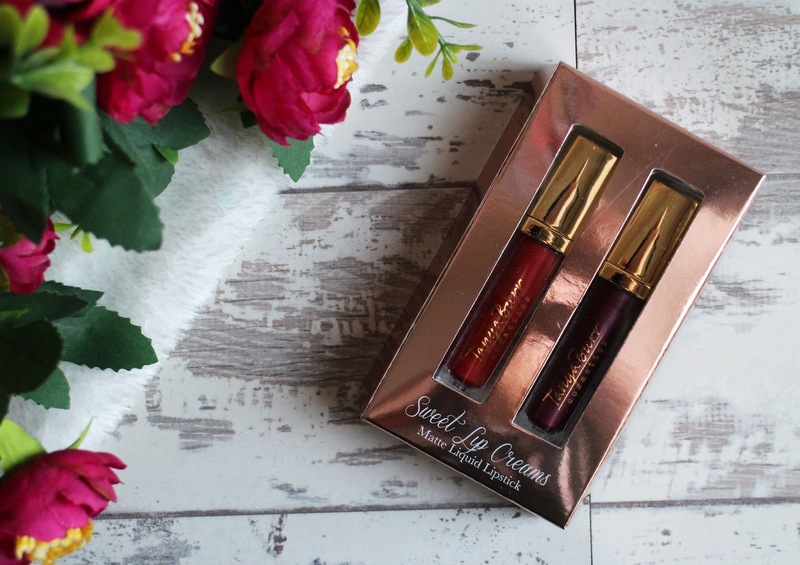 This adorable little set was impossible to pass up - i love matte liquid lipsticks and the two shades in this set are my favourite kind of colours so for the price there was no way i wasn't giving these a try. 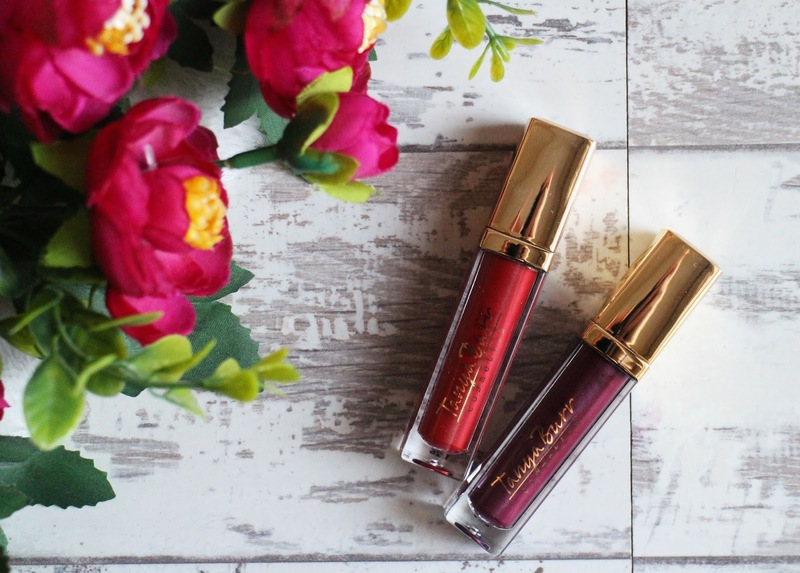 I've only tried her earlier lip glosses which as i mentioned earlier the formula was a bit questionable (thick and sticky) so i was intrigued to see whether I'd like these or not and i have to say i am very impressed with these. 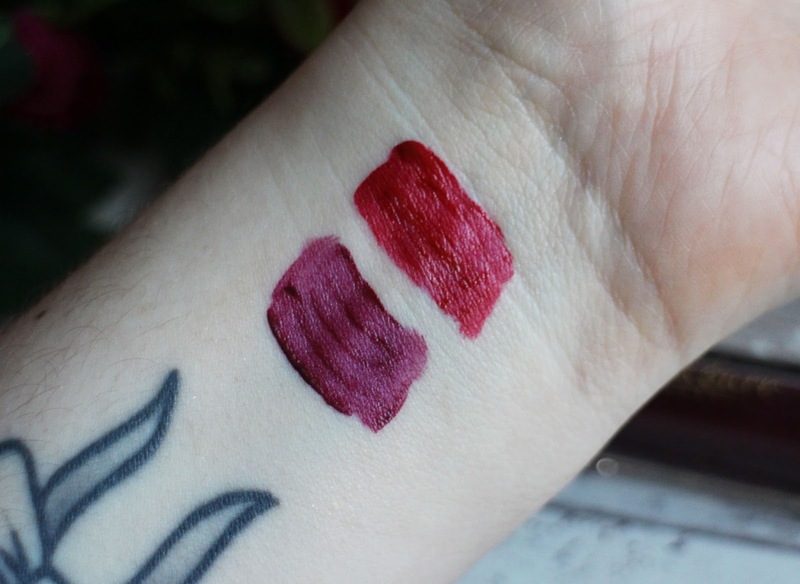 You get the shades; Blackberry which is a gorgeous purple berry tone (it actually reminds me a lot of Kat Von D's Exorcism liquid lipstick) and Santa's Little Helper which is a beautiful classic red - these two are my ideal shades to wear so I'm really happy with the choice in shades she went with. The doufat applicators don't pick up a massive amount of product which really helps to apply a thin layer, they're very creamy and feel really comfortable on the lips. They dry down matte but they don't feel drying, it takes minimum effort to get a full opaque lip and not to mention, they smell really good. I'm really impressed with these and i know I'll get a lot of wear out of these shade, i really like the formula and they last ages too. I'm always quite cynical about trying Youtuber ranges; simply because their fellow youtube friends hype them up so much and then they're not always that great but I'll hold my hands up and say that these two sets in particular are actually really nice and I'll definitely reconsider trying more of her make up products in future. Did you get pick up any sets in the Boxing Day Sales?